Customer states car is difficult to get started...says it takes anywhere from 10 seconds to 30 seconds to get it to fire. Also, customer states after an hour or so the car will die and not fire back up until it cools down. All 3 sensors, Crank and both Cam sensors, have been replaced with genuine OEM Nissan sensors. We tested power and ground to the crank sensor and they both checked good. This is a pull up design...no power on signal wire when unplugged, then when plugged in the signal wire has source voltage. We hooked up the scope to the signal wire, harness plugged in (back probing), and it just displayed the source voltage, no square wave. After some time...maybe 20 to 30 min of the engine running, the crank sensor started showing a square wave? We even connected a 3rd scope lead to the bank1 cam sensor and had all 3 showing a square wave. The car ran for over an hour and did not shut off...after about an hour and 20 min, I killed the engine, then fired it back up (took about 10 seconds of cranking), and all 3 sensors still had square waves. We cleared the codes, disconnected the battery for about 30 min, hooked it back up, fired up the car (again took about 10-15 seconds), and all 3 sensors still had a square wave...yet the 2 codes still came back? This morning, hooked up the scope to the crank sensor...no square wave, just source voltage. You could try a long crank test, disable the injection to prevent starting and connect 3 scope channels to the signal, power and ground of the crank sensor. Last edit: 02 Apr 2019 03:00 by Andy.MacFadyen. I am having the same codes on my 2010 Rogue right now and the same 'long start' though only about 5-7 seconds. I have a feeling its a corroded connector issue in the fuse/relay box. Will be following your post! And I'll let you know if I make any breakthroughs. blue cmp trace goes from negative 4 volts to negative 9 volts, green cmp goes from pos 4 volts to neg 4volts and ckp trace shows pos 4 volt transitions. They all should show 0 to pos 12 volt transitions. Make sure you are connected to the correct wires and that the signals get to the ecm. A mayor clue seems to be that when the crank signal is present -as well in the picture as in the video - this actually does not look like the legit crank signal. 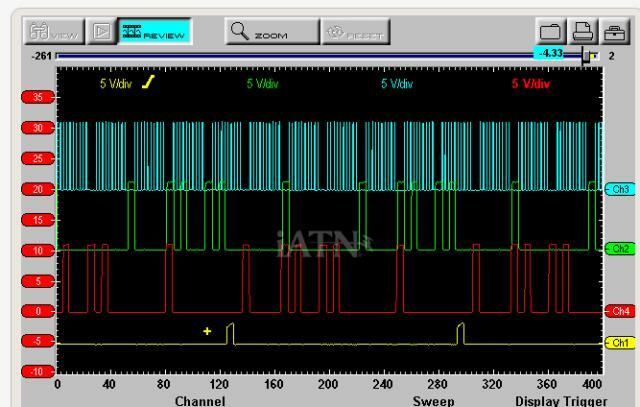 It is a miiror image of a cam signal, the correct crank signal is quiet different! I'll attach the signal examples from the SFM and a known good pattern. Once again, have a close look at the involved wires, their continuities from sensors to the ecm, check for shorts between signals wires themselfes, shorts between signal wires and 12 volt power feeds and so on. I, for now anyway, wasn't able to do a long crank test; however, I did what was suggested as far as using 3 probes and having one on power, one on ground, and one on signal...though this was all while the engine was running. My thinking on why a long crank test would be valuable was it may show up an issue with the sensor ground or supply voltage. I disconnected both connectors from the ECM, disconnected all 3 sensors, and then started checking the continuity of each wire. All 3 sensor signal wires ohm out fine, as do all of the power wires. These were tested by grounding the appropriate pin on the ECM connector and then probing the corresponding pin on the sensor connector. I then tested to make sure the signal wires weren't shorted to each other as well as checking that power wires weren't shorted to the signal wires...all checked good. So I am ummm really confused here as to what the problem is as well as where to go to look for the problem. DSKRacingElement wrote: I then tested to make sure the signal wires weren't shorted to each other as well as checking that power wires weren't shorted to the signal wires...all checked good. I did the tests with the key on, ecu and sensors disconnected, and didn't see any wires interfering with each other. With the ecu/ecm disconnected and the key in the On position, the fans come on...not sure why that is?